Hi. Back from Germany. Turns out that I was too busy to cook for the blog while there. I did have tons of great food there, which I’ll try to recreate in future blogs. Great game tonight between Germany and Brazil (though, I feel bad for Brazil). Anyway, tonight’s dish is a very simple, delicious Indonesian chicken dish. There is no heat in this dish, but you can add some if you like. Browning the chicken first (which I don’t think is very Indonesian) helps to keep the chick very moist. Yum — hope you’ll try it tonight! Combine chicken chunks with salt and pepper in a large bowl. Set aside (let stand 10 minutes). Heat oil in a wok or large frying pan over high heat. Add chicken and brown 3 minutes. Add garlic and stir-fry another 1 minute. Add ginger, brown sugar and stir. Add terasi and stir-fry for 2 minutes. Stir in spring onions, soy sauce and water. Cover and reduce heat to low. Simmer 25 minutes. Remove lid and cook another 5 minutes, or until sauce is very thick. Serve with steamed coconut rice and peeled, quartered hard-boiled eggs. This entry was posted in Chicken, Indonesian, Main Dishes and tagged Cooking, Food, Food Photography, Foodie, Indonesian, Indonesian Food, Jasmine Rice, Recipes, Southeast Asian Food on July 8, 2014 by AnotherDish. Thanks, Fae. There’s so much interesting food in Germany. ; from local cuisine (from Frankfurter Schnitzel mit grüner Soße to Handkäse mit Musik), to Turkish döner) it’s all so good! Thanks, Natalia. I really enjoyed watching the World Cup. Welcome back and what a fabulous chicken recipe to return with. I’ll have to look up both terasi and keycap manis… and I too am looking forward to your German food posts. Thanks! I may have to wait until fall for the German recipes, since they tend to be heavier. Ah, this is a Peranakan Chinese Dish. Ayam O is fused from two words from two different languages. It simply means blackened chicken. 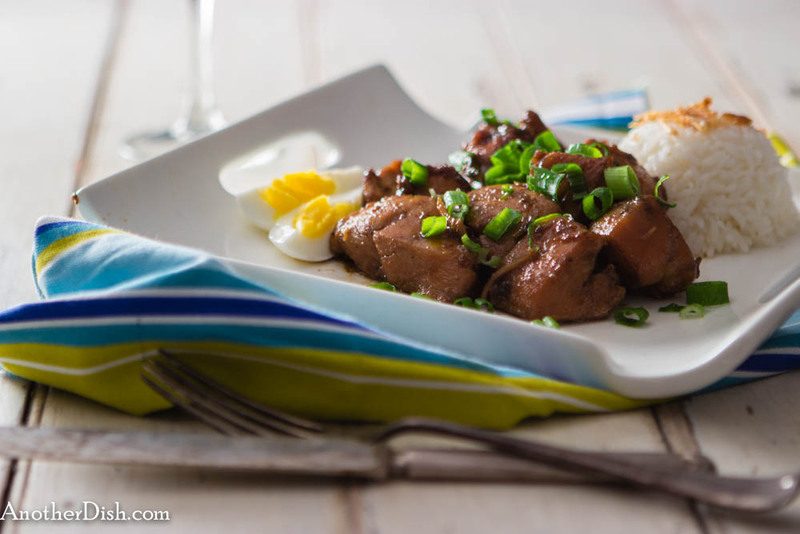 The Cantonese folks usually blacken the pork legs and hard boiled eggs. Hari, thanks for the insight! This helps readers better understand this recipe.